Sensaphone’s cloud-based Sentinel PRO allows you to monitor remote facilities and environments and check critical conditions of your climate-sensitive commodities with the same degree of certainty you’ve come to expect from Sensaphone. 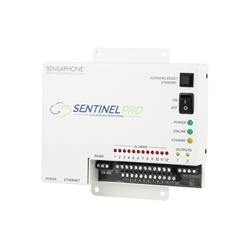 The system monitors, delivers alarms, and datalogs input/output points from third-party Modbus sensors, transducers and programmable logic controllers. The system supports Modbus RTU/485 and Modbus TCP. It takes the burden out of managing your system by giving you access to your readings from anywhere using a simple, powerful web-based interface. If there’s a disruption, you’ll be the first to know. Alerts can be sent straight to your mobile device—keeping you updated and giving you peace-of-mind wherever you are so you can remain focused on business as usual.